Courtesy photo Members of the psychology club at Mount Aloysius College, Cresson, delivered “baskets of appreciation” recently to local EMS, police, firefighters and military organizations to show their appreciation with a “Service to Those Who Serve and Protect Us.” In the photo, Mount students (left) Hali Steigerwalt of Lehighton and Hanna Conlon of Huntingdon deliver a basket to Cpl. John Matchik at the Ebensburg State Police Barracks. 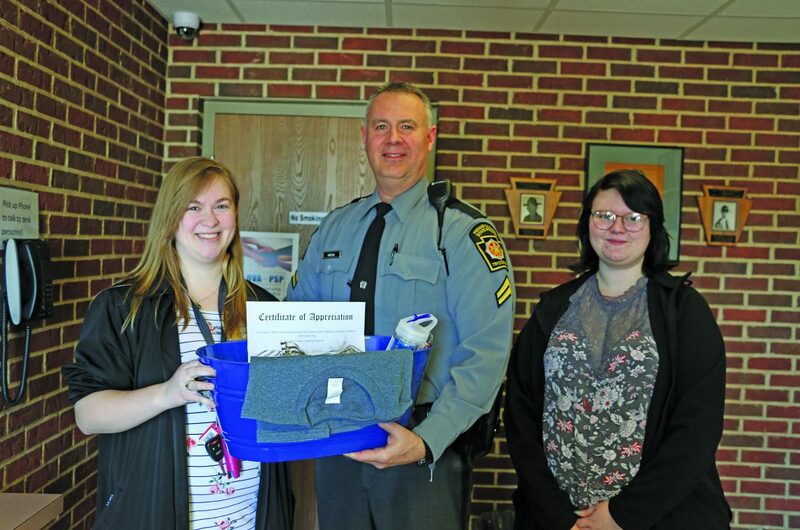 Members of the psychology club at Mount Aloysius College, Cresson, delivered “baskets of appreciation” recently to local EMS, police, firefighters and military organizations to show their appreciation with a “Service to Those Who Serve and Protect Us.” In the photo, Mount students (left) Hali Steigerwalt of Lehighton and Hanna Conlon of Huntingdon deliver a basket to Cpl. John Matchik at the Ebensburg State Police Barracks. EVERETT — The Bedford County Regional Education Foundation awarded five Allegany College of Maryland Bedford County Campus tuition vouchers totaling $1,500 to prospective students at the college’s 22nd annual open house on Nov. 17. Local recipients were Madison Cottle and McKenzie Westphal, both of Everett. LATROBE — A total of 121 new members were inducted into Saint Vincent College’s chapter of Alpha Lambda Delta. ALD is an international honor society for first-year students with outstanding academic achievement. Students must maintain a grade point average of 3.5 or higher during their first year of study to be considered for membership in the organization. The newly inducted students include Maura Skelly, Altoona; Hannah Miller, DuBois; Erin Choby, Patton; Patrick Hoover, Patton. BATON ROUGE, La. — The following local residents were recently initiated into The Honor Society of Phi Kappa Phi, the nation’s oldest and most selective all-discipline collegiate honor society. n James O’Donnell of Altoona was initiated at Youngstown State University. n Brock Ruth of DuBois was initiated at Slippery Rock University of Pennsylvania. into the society each year. Membership is by invitation only and requires nomination and approval by a chapter. Only the top 10 percent of seniors and 7.5 percent of juniors are eligible for membership. Graduate students in the top 10 percent of the number of candidates for graduate degrees may also qualify, as do faculty, professional staff and alumni who have achieved scholarly distinction.